Palace Station's variety of slot machines and table games means there's something for everyone, including the most Baccarat and Pai Gow tile games off the Strip. 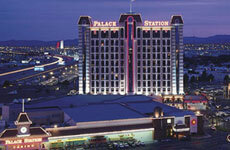 Palace Station Hotel and Casino have returned to our classic 8-session format! What's that mean? More chances to win and more fun! Session times: 9am, 11am, 1pm, 3pm, 5pm, 7pm, 9pm and 11pm. Play Jumbo Bingo, Big 3 Bingo, and Countdown Coveralls! Our Keno lounge is located near the Grand Café and it is open 24 hours a day, 7 days a week. We Have two Keno games in our Keno Lounge for your enjoyment. Now bigger and better with wall to wall plasma TVs! 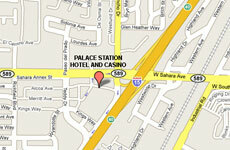 Offering the best games in town, Palace's nine-table poker room is one of the most popular in Las Vegas. Games include Texas Hold'em and Omaha. Bad Beat jackpots increase daily. Seating is on a first-come, first-served basis. Reserved table's with 8 or more players, good for parties, conventions or just a night out. Palace Station Hotel and Casino now offer food with your points delivered to your table, from 7pm till 11pm, Tuesday through Thursday, and 7pm till 2am Friday and Saturday, from "Jack's Irish pub." $5.00 Food comps with three hours worth of play. With over 100,000 square feet of gaming space, Palace Station has some of the most innovative games available for its guests. Triple Play, Bonus Poker, and a Station creation, Reversible Royals video poker, are among the games found at Palace Station. In addition, progressive games such as Megabucks and Wheel of Fortune are also available. Now introducing the first and only in Las Vegas , U Shake Bo! Control your luck, have more fun!